I’ll tag Acmegirl, Thing1 and Thing2; Janet and Sprogs; drdrA and her Atheists-in-Training; Isis and Baby Isis. You seriously did these?? Dammmmnn. 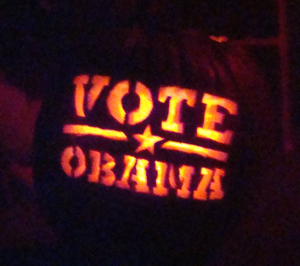 I saw the page of Barack-o-Lanterns but only Dr Hyde has the nerve to try it. Also our track record on pumpkins is pisspoor. Last year we didn’t carve one, just put it outside with the eventual plan of eating it. Sometime around February it started to rot so we threw it out. Just call me Dr Homemaker. Anyhow, the vote obama one is very cool and looks tractable even for losers like us. Maybe we’ll give it a whirl….Nicely done! in the spirit of PP and ItS, I will reveal my sekrits. you must have the special tools. and the patterns. after that it is simple. The Obama lantern pic is taken at an angle that makes it look like Barack is wearing a yarmulke. I think that has the potential to fry some fundie brains. OMG, a Mulsim Jew! Correction, you meant to say a half-breed Muslin Jew. Half-breed Muslin Jew? No sheet! If I’d cotton to that before fabricating the joke I’d have gone with “OMG, a Muslin Jute”. Damn, I think you outpunned even the Wonketteers. Hats off. Awesome! 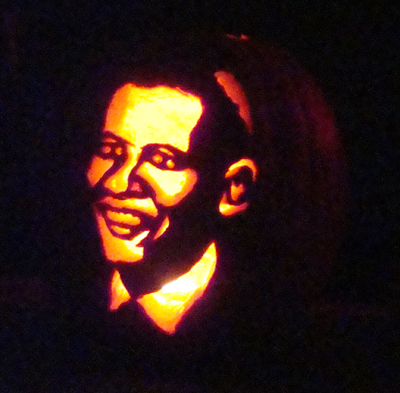 Barack-o-lanterns! Love it! I put our Jack-o-lanterns up tonight. Great fun! Thanks for the tag! You know, it really hurts my feelings that I got not a single reply from my favorite BM about Little Isis’s pumpkin. More importantly, it really hurt his. « Palin Ruins Everything She Touches!!! You are currently reading Happy Hallo-Meme at Sun Dappled Forest.